After the "Xiang Rui Ku" reached Singapore on Apr 20, the damaged rig "Kulluk" was unloaded from its submerged deck at West Jurong Anchorage. The tugs doing the job were the "Maju 510", "Maju 511", "Maju 512" and "KST Zodiac". On Apr 23 the carrier left Singapore again bound for Hian Jin with an ETA of May 2. 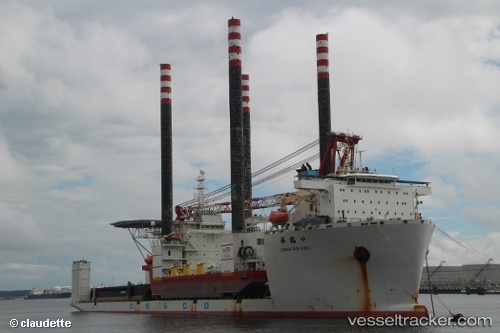 The "Xiang Rui Kou" arrived loaded with the damaged rig "Kulluk" on deck in Singapore on Apr 20 at 11.30 a.m. In the evening of Mar 27 the "Xiang Rui Kou" was finally s steaming into the Bering Sea Great Circle Route bound to Asia with the "Kulluk" on deck. The Foss tugs were also leaving at this time so the transit really started.